Being a self confessed sweets addict, I am constantly looking out for sweet shops. Some of my favorite sweet shops in Chandni Chowk are – Chaina Ram in Fatehpuri Chowk for Karanchi halwa and sev badam, Hajari Lal Jain in Kinari Bazar for rabri and khurchan, Ghantewala near Fountain Chowk for sohan halwa, Tewari brothers near Town Hall for motichur ke laddu, Annapurna Sweets opposite Seeshganj Gurudwara for Bengali sweets and of course, Dariba Kalan’s famous jalebi. I was walking down the Dariba street when I spotted a mithai wala selling varieties of colorful mithais beautifully decorated with chandi vrak in separate trays. These trays were laid on the stairs of one of the Jewellery shops in Dariba Kalan. The owner, Naresh Kumar evenly spread sheets of edible chandi varak over the sweets, sprinkled pistachios burada, and covered the sweets with nets to keep flies away. Naresh Kumar sells the sweets opposite Gali Kunjas in Dariba Kalan between Ramtaur Jewellers and Swastik Jewellers shop from 5 pm onwards. He learnt the art of making sweets from his father, who is well-known as Bhaiya lal. Bhaiya lal started the sweet shop in his name in 1936 at Shop no. 3459, Hauz Qazi, Subzi Market and Naresh Kumar took over in 1962. He has been selling the same variety of sweets. The menu consists of Bengali mithai – Rasbhari, Parmal stuffed with khoya, cham cham, lauki burfi, Pineapple burfi, nariyal burfi. All the sweets are prepared in a more or less similar way – with khoya as the main ingredient. All of them costs Rs 400/- kg. The sweets are weighed by using a tarazu (balance scale). What intrigued me most was the Pineapple burfi, which I had tasted for the first time at this sweets shop. It turned out to be excellent because it was just the right amount of sweet. It was prepared adding pineapple syrup to roasted khoya.Another Bengali sweet, Rasbhari which are small rasgullas were different from the ones we usually get. Rasbhari was not soaked in sugar syrup, it was dry from the outside and the centre was filled with thickened sugar syrup so that as soon as one bites into it their mouth fills with the sweet syrup. Other sweets, cham cham, lauki burfi, and nariyal burfi were equally amazing. 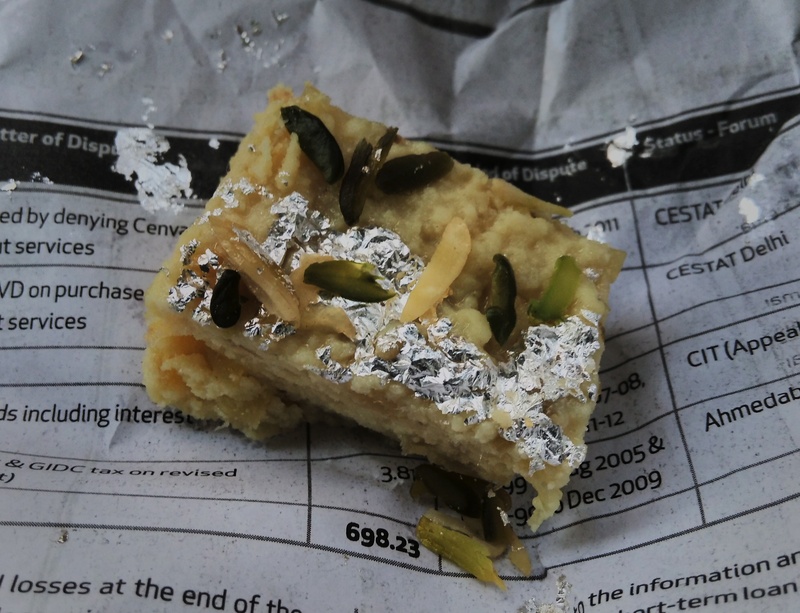 I am delighted to add Bhaiya Lal’s sweets to my list of favorite Sweets shops in Chandni Chowk!